Not too long ago I was able to read A Most Unsuitable Match by Stephanie Grace Whitson and I really enjoyed it. Right away I was snagged by a question the heroine, Fannie Rousseau, wondered about. When you pose a question and neglect to answer it right away, your brain will be on the alert for the answer until the question is resolved. Using this in a book is way to keep readers turning the pages, looking for the answer. Even better than simply stating the question, though, is to invest lots of emotion in it. Kneeling before the tombstone, eighteen-year-old Fannie Rousseau retrieved the scrub brush from the water bucket she'd just settled in the grass. This sets the stage for an emotion-packed opening where she ups the ante with Fannie's inner turmoil, making us anxious to discover (with Fannie) what's the at the root of it. There it was again, the increasingly frequent tinge of annoyance that always mingled with Fannie's grief. What good did a stone angel do? It was too late for Papa to know how Mother felt about him. And now it was too late for Fannie, too. Any chance she might had had to understand Mother was forever lost. Lately, all Fannie's doubts and questions over the years seemed to have rolled themselves into a fast-growing, ever-darkening cloud of emotions she didn't quite know how to handle. This morning that cloud had been especially dense. And so, feeling confused and guilty about every negative thing she'd ever felt against Mother and not wanting to face the people at church, she'd come here. Tending a grave was something a good daughter would do, wasn't it? Something a daughter should do. She glanced up at the stone angel. Was Mother feeling just this way after Papa died? Did she have regrets? Had ordering the angel made her feel better? More than just a simple question, I was caught by Fannie's inner turmoil and feelings. I sensed that there were missing pieces inside her—pieces that were just vague shapes to her—and I wanted to know what they were, just like Fannie did. I wanted to know why she felt that way and I wanted resolution. I needed resolution and that need kept me turning the pages. Sprinkled throughout the book were slivers of this puzzle, a hint here and a glimpse there, each bit adding to what I already knew. It drove me onward. Woven in with the inner turmoil and questions, was a lovely thread of friendship—old and new friends, and we see Fannie growing and maturing and reaching out and contributing to others' lives in meaningful ways, and being blessed through it. It was both heartwarming and convicting. Am I reaching beyond my personal life and contributing to others or am I so caught up in myself I don't even see them? 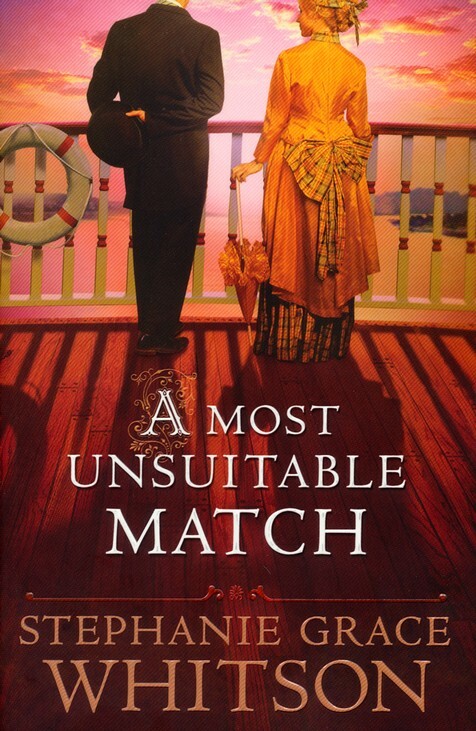 A Most Unsuitable Match is full of twists and turns for both Fannie and Sam which kept me interested and wondering just how all the pieces would come together, but come together they did, with smiles and tears as I read. She is a self-centered young woman from a privileged family who fears the outdoors and avoids anything rustic. He is a preacher living under a sense of duty and obligation to love the unlovable people in the world. She isn't letting anything deter her from solving a family mystery that surfaced after her mother's death. He is on a mission to reach the rejects of society in the remote wilderness regions of Montana. Miss Fannie Rousseau and Reverend Samuel Beck are opposites in every way . . . except in how they both keep wondering if their paths will ever cross again. This is SUCH a fabulous series, Peejers. Adore how you're weaving the craft lesson in. SUCH a smarty you are! ;) Will definitely need to remember this. I really enjoyed reading A Most Unsuitable Match this summer, too! Good point about the unanswered questions--you've set me to thinking about my own wip. :) I love learning from good authors! Now I MUST READ A Most Unsuitable Match! Thanks for writing lesson--love it!